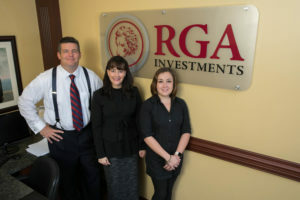 RGA Investments is a Triangle-based wealth management firm, focused on assisting clients in every aspect of their financial lives. RGA Investments offers comprehensive financial services, including investment advice, full financial plan implementation and ongoing, continuous management. The firm is led by Rick Gardner, president, who has more than 15 years of experience as a strategic partner for wealth management services at Paragon Bank. Gardner is the former co-founder and director of Crescent Investment Services in partnership with Crescent State Bank.